Each year, beginning in late July, we start meticulously planning and prepping for the upcoming year’s Visitor’s Guide. With the new year right around the corner, we couldn’t be more excited to give you a quick preview. Choosing only five “Hub City” dishes to highlight each year has become one of the hardest (and best) parts of visitor’s guide planning, and 2017 was no different. We (somehow) managed to narrow it down to five more can’t-miss Foodie Faves ranging from Thai food to traditional home cooking. We love our local barbecue so much we gave it it’s own spread. Here we showcase everything from a Texas Monthly standout to a Depot Entertainment District favorite. Football season is the most wonderful time of the year in Lubbock thanks to our Texas Tech Red Raiders. This year, we are dishing on all the extras you’ll need to take your game day experience to the next level. Each year, Lubbock hosts thousands of cultural events. These are the ones you need to add to your 2017 calendar. Throughout the guide, you’ll find fun facts about Lubbock, what others are saying (and posting) about our fair city and new to this year’s guide, Confessions of a Lubbock Legend. On these pages, you’ll hear from William Clark Green, Jo Harvey Allen and Flatland Cavalry frontman Cleto Cordero about their favorite Lubbock places and spaces. 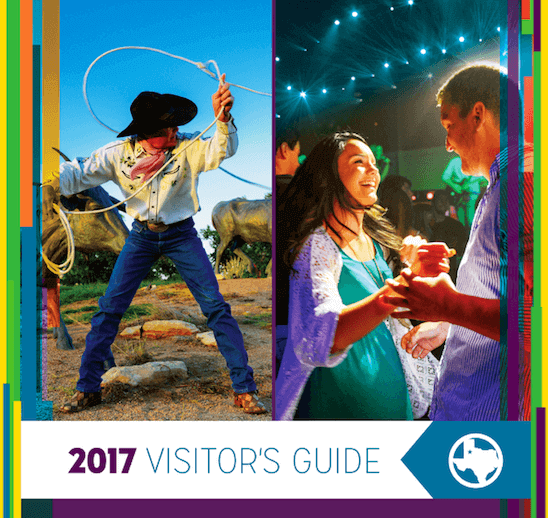 If you can’t wait to get your hands on a copy of the 2017 Visitor’s Guide, you can view the interactive version or request your free printed copy here.